As February comes to a close, one of our snowiest months, March, is ahead. 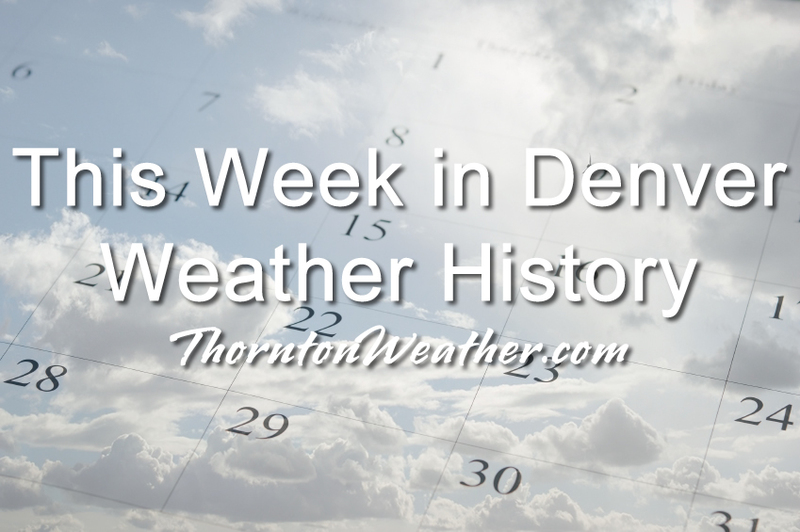 Our look back at this week in Denver weather history shows there have indeed been some significant snowfalls as well as high wind events. In 1960…heavy snowfall of 6.1 inches at Stapleton Airport on the 22nd and 23rd marked the beginning of a protracted cold spell which lasted until the end of the month. The cloudy… Cold weather was accompanied by occasional light snow or flurries and fog. New record low temperatures for the dates were set on the 24th thru the 29th with the lowest temperature of 11 degrees below zero on the 28th. The seven consecutive days of low temperatures of zero or below had been exceeded in duration only 4 times previously. New low maximum temperatures for the dates were set on the 23rd… 24th…and the 26th thru the 29th with the lowest maximum temperature of 8 degrees recorded on the 26th. In 1935…northwest winds sustained to 37 mph with gusts as high as 47 mph produced considerable blowing dust behind a cold front on the 23rd. The dust was dampened by 7.0 inches of snowfall over downtown Denver from the late evening of the 23rd through the evening of the 24th. In 1997…heavy snow fell in the foothills. Snowfall totals included 8 inches at sunshine canyon northwest of Boulder… And 6 inches at Morrison. Snowfall totaled only 2.4 inches at the site of the former Stapleton International Airport. East winds gusted to only 22 mph at Denver International Airport on the 23rd. In 1912…a severe winter storm dumped 14.2 inches of snowfall over downtown Denver. Snow fell continuously from 9:40 am on the 23rd until 9:15 pm on the 25th with most of the snow… 9.2 inches…on the 24th. Temperatures were mostly in the 20’s. Northeast winds were sustained to 20 mph on the 24th. In 1908…a duststorm occured in the city from mid-morning through mid-day. North winds were sustained from 30 to 35 mph. In 1927…northwest winds were sustained to 42 mph with an extreme velocity to 46 mph. In 1924…fog deposited a light coating of glaze…which was very thin and only accumulated on the windward side of cold objects. Streets and sidewalks became slippery. In 1956…a strong cold front produced north wind gusts to 54 mph…but left only 2.0 inches of snowfall at Stapleton Airport. In 1959…heavy snowfall totaled 7.5 inches at Stapleton Airport…where north-northeast winds gusted to only 18 mph. In 1968…west-northwest winds gusted to 49 mph at Stapleton International Airport. The strong Chinook winds warmed the maximum temperature to 61 degrees…the highest temperature of the month that year. In 1986…wind gusts to 65 mph were reported at Table Mesa in Boulder. West winds gusted to only 28 mph at Stapleton International Airport where the high temperature of 70 degrees equaled the record for the date. In 1991…the only measurable snowfall for the month totaled only 0.8 inch at Stapleton International Airport where north winds gusted to 28 mph. The light snow fell for most of the day. In 1994…high winds raked the eastern foothills. Wind speeds of 70 to 80 mph were common. Wind gusts to 110 mph were recorded at the National Center for Atmospheric Research in south Boulder…while in north Boulder winds gusted to 95 mph. The strong winds blew the roof off a building at red rocks community college in Lakewood…causing the evacuation of about 1500 people. A semi-trailer and a delivery truck were overturned. In Lakewood…a home under construction was destroyed by the winds. There were numerous reports of vehicles damaged by flying debris…and many automobile windshields were shattered. West wind gusts to 47 mph were recorded at Stapleton International Airport. In 2013…A storm system near the Four Corners region produced heavy upslope snowfall in and near the Front Range with blizzard conditions further east as it made its way across southern Colorado. In the Front Range Mountains and Foothills storm totals included: 27 inches near Pinecliffe; 24 inches…13 miles northwest of Golden; 20 inches near Genesee; 17 inches near Conifer; 15 inches near Jamestown; 14 inches…just southwest of Eldorado Springs; 12.5 inches near Aspen Springs; 12 inches near Evergreen and Ward; 10 inches at Eldora Ski Area; with 8 inches near Gross Reservoir…Idaho Springs and Nederland. Across the Urban Corridor storm totals included: 12 inches in Aurora; 11.5 inches near Highlands Ranch; 11 inches in Lakewood; 10.5 inches just north of Longmont and Westminster; 10 inches in Lone Tree and Thornton; 8.5 inches in Aurora…6 miles southwest of Denver and near Loveland; 8 inches at Boulder… Broomfield…and Ralston Reservoir; 7.5 inches near Frederick…with 7 inches at Commerce City. The storm prompted the cancellation of 200 flights in and out of Denver International Airport. Officially…the storm system produced 9.1 inches of snow at DIA which established a new daily snowfall record in Denver for the date. Along and south of the I-70 corridor and east of Denver…the combination of heavy snow and strong wind produced blizzard conditions. Storm totals included: 14 inches…10 miles south-southeast of Buckley AFB…10.5 inches…8 miles southeast of Watkins; with 6 inches near Byers. Northerly winds of 25 to 30 mph were common with gusts to 40 mph. At DIA…a peak wind gust of 32 mph was observed. In 1887…northwest winds were sustained to 47 mph. In 1904…the low temperature cooled to only 49 degrees…the all-time record high minimum temperature for February. In 1957…north winds gusted to 49 mph at Stapleton Airport. In 1998…a bora wind storm developed in the Front Range foothills and adjacent plains as winds gusted between 60 and 75 mph. Peak wind gusts during the storm included: 75 mph atop Blue Mountain near Wondervu…60 mph in south Boulder and at Jefferson County Airport near Broomfield. West winds gusted to 32 mph at Denver International Airport. In 2000…high winds occurred in and near the foothills. Winds gusted to 84 mph at the Rocky Flats Environmental Test Facility south of Boulder and to 71 mph atop Niwot Ridge in the mountains west of Boulder. West winds gusted to only 36 mph at Denver International Airport. In 1971…a wind gust to 100 mph was recorded in Boulder at the National Center for Atmospheric Research. The cold west winds gusted to 53 mph in downtown Boulder. No damage was reported. Northwest winds gusted to 31 mph on the 25th and to 38 mph on the 26th at Stapleton International Airport. In 1984…a heavy snow storm left 1 to 2 feet of new snow in the foothills west of Denver. I-70 was closed…stranding skiers returning from the mountains. Most had to spend several hours in Idaho Springs. The snow spread over metro Denver with 9 inches at Littleton…Castle Rock…and Boulder and up to 5 inches in Aurora and Denver. Snowfall totaled only 3.6 inches at Stapleton International Airport where north winds gusted to 31 mph. In 1884…heavy snowfall totaled 6.0 inches in downtown Denver. In 1908…a duststorm occurred in the city during the afternoon. Northwest winds were sustained from 14 to 24 mph. In 1918…pre-frontal Chinook winds from the southwest… Sustained to 43 mph with a maximum velocity to 52 mph… Warmed temperatures to a high of 62 degrees. In 1954…strong Chinook winds gusting to 52 mph during the morning warmed the temperature in Denver to a balmy 65 degrees by early afternoon. A vigorous Canadian cold front during the late afternoon produced north winds at sustained speeds of 52 mph with gusts as high as 65 mph and billows of blowing dust…which reduced the visibility to as low as 1 mile at Stapleton Airport. Showers left half an inch of snow on the ground as the temperature dipped to a low of 27 degrees before midnight. In 1989…a brief rain shower produced a microburst wind gust to 51 mph at Stapleton International Airport. In 1997…snowfall totaled 4 to 6 inches in and near the foothills. Only 0.8 inch of snow fell at the site of the former Stapleton International Airport. Northeast winds gusted to 29 mph at Denver International Airport. In 2013…a storm system produced heavy snow in the Front Range Foothills. Storm totals included: 12 inches near Black Mountain and Pine Junction…10 inches near Conifer and Nederland; 9 inches…12 miles northwest of Golden; 8 inches near Evergreen…with 6 inches near Eldorado Springs. Snow and blowing snow produced blizzard conditions along and south of the Interstate 70 corridor…just east of Denver. Storm totals generally ranged from 3 to 7 inches. North winds of 25 to 30 mph were reported with gusts around 40 mph. Roads became impassable as snow and blowing snow produced 3 to 4 ft snow drifts. Interstate 70 was closed from Aurora to the Kansas state line. At Denver International Airport…a peak wind gust to 31 mph was reported along with 1.0 inch of snow. In 1893…heavy snowfall totaled 7.9 inches in downtown Denver. Most of the snow…6.7 inches…fell on the 27th. Northeast winds were sustained to 18 mph with gusts to 30 mph behind an apparent cold front. In 1939…heavy snowfall of 8.1 inches was the heaviest of the month in downtown Denver. North winds sustained to 21 mph on the 26th and to 28 mph on the 27th caused much drifting. The greatest snow depth on the ground was 7.8 inches at noon on the 27th. In 1987…a snowstorm dropped 4 to 8 inches of snow across metro Denver…causing flight delays at Stapleton International Airport where snowfall totaled 3.8 inches and north winds gusted to 24 mph. Both I-70 and I-25 were closed for a time to the east and south of Denver. In 1896…northwest winds were sustained to 46 mph with gusts to 58 mph. In 1902…northwest winds were sustained to 50 mph with gusts as high as 60 mph. The high temperature was 44 degrees. In 1918…a post-frontal heavy snow storm developed over downtown Denver. Snowfall totaled 8.4 inches and north winds were sustained to 30 mph with a maximum velocity to 32 mph. In 1963…west winds gusted to 55 mph at Stapleton Airport. In 1974…a wind gust to 99 mph was recorded in Boulder. West winds gusted to 43 mph at Stapleton International Airport. In 2009…a strong wind gusts blew a trailer in the path of two vehicles along State Highway 36…between Boulder and Lyons. The two vehicles were in the northbound lane when a wind gust blew a fifth-wheel trailer into their path… As it approached from the opposite lane. The trailer left the road surface…and collided with the top left side of the first car; causing extensive damage. A van following the first vehicle then struck the trailer. The driver of the van suffered facial injuries. In 1918…heavy snowfall totaled 9.6 inches in downtown Denver. Most of the snow…8.4 inches…fell on the 27th. In 1931…a major winter storm dumped 12.0 inches of heavy snowfall over downtown Denver. This is the greatest 24 hour snowfall ever recorded during the month of February. North winds gusted to 18 mph on the 28th. In 2006…a warm spell resulted in 3 temperature records. The high temperature of 73 degrees on the 27th equaled the record high for the date. High temperature of 77 degrees on the 28th was a record high for the date and equaled the all-time record high temperature for February first set on February 4…1890. In 1896…northwest winds were sustained to 54 mph with gusts to 65 mph. The winds warmed the temperature to a high of 56 degrees. This was the second consecutive day of strong winds in the city. In 1958…at Stapleton Airport…snowfall totaled 5.3 inches and northeast winds gusted to 24 mph. In 2012…another round of high winds occurred along the Front Range foothills. Peak wind gusts included: 84 mph at the national wind technology center; 77 mph…3 miles south-southwest of Boulder; and 75 mph…3 miles southwest of Rocky Flats. At Denver International Airport…west winds gusted to 36 mph on the 28th and 35 mph on the 29th. In 1875…6 inches of snow fell from 3:15 pm on the 28th to 1:00 am on the 1st. Precipitation for the two days was 0.50 inch. In 1896…southwest winds were sustained to 41 mph with gusts to 60 mph. This was the third consecutive day that strong winds occurred in the city. In 1992…Chinook winds gusted to only 25 mph at Stapleton International Airport…but warmed the temperature to a high of 70 degrees…which equaled the record for the date first set in 1940. In 2004…only light snow fell across metro Denver…while a blizzard raged across northeast Colorado. Both I-70 and I-76 were closed to the east of Denver by winds gusting to 60 mph producing drifting snow to depths of 2 to 6 feet. Snowfall was only 1.6 inches at the Denver Stapleton site. North winds gusted to 41 mph at Denver International Airport. In 1896…snowfall totaled 5.5 inches in the city. Northeast winds gusted to 24 mph. In 1948…snowfall totaled 5.9 inches in downtown Denver. North winds were sustained to 15 mph. In 1904…west winds were sustained to 42 mph with gusts as high as 58 mph. The Chinook winds warmed the temperature to a high of 67 degrees. In 1906…snowfall was heavy and totaled 7.5 inches over downtown Denver. Northeast winds were sustained to 37 mph. In 1940…snowfall was heavy and totaled 7.7 inches in downtown Denver. In 1943…6.0 inches of snow fell over downtown Denver. North winds were sustained to 19 mph. In 1956…west-northwest wind gusts to 52 mph were recorded at Stapleton Airport. In 1961…a wind gust to 65 mph was recorded at the Colorado building in downtown Boulder. The high winds caused some minor damage. Northwest winds gusted to 43 mph at Stapleton International Airport. In 1974…a wind gust to 77 mph was recorded in Boulder. Southwest winds gusted to 37 mph at Stapleton International Airport. In 2002…upslope conditions caused heavy snow to develop in and near the eastern foothills. Snow totals included 14 inches at Eldorado Springs and near Genesee; 13 inches atop Lookout Mountain; 12 inches in Coal Creek Canyon; 10 inches in Nederland and just east of Boulder; 9 inches in Boulder and Morrison; and 8 inches at Broomfield…Erie… Golden…Louisville…and Littleton. Snowfall totaled 6.5 inches at the site of the former Stapleton International Airport. Northeast winds gusted to 31 mph at Denver International Airport. In 2014…a localized band of heavy snow over downtown Denver produced around one inch in less than 30 minutes and contributed to a chain of accidents in the northbound lanes of Interstate 25…between Logan Street and University Blvd. The combination of excessive speed and very poor driving conditions led the chain reaction; it involved 104 vehicles and resulted in one death along with 30 injuries. The interstate was closed for approximately 5 hours. At Denver International Airport…1 inch of snow was observed. In 1969…heavy snowfall totaled 7.0 inches at Stapleton International Airport where north-northwest winds gusted to 18 mph. In 1988…3 to 6 inches of snow fell over metro Denver. Snowfall totaled 3.2 inches at Stapleton International Airport where north winds gusted to 32 mph. In 2003…localized heavy snow developed in the foothills of Jefferson County. Storm totals included: 12.5 inches near Conifer…11 inches in the foothills southwest of Boulder…and 10 inches near Genesee. Only 0.9 inch of snow fell at the site of the former Stapleton International Airport. In 1904…west winds sustained to 52 mph with gusts to 60 mph warmed the temperature to a high of 68 degrees. Snowfall was 0.4 inch in the evening. In 2008…a storm system brought heavy snow to portions of the Front Range foothills; as well as localized blizzard conditions to areas along the Palmer Divide. In the foothills of Jefferson and park counties storm totals included: 16 inches at Genesee…14 inches…4 miles south of Evergreen; 13 inches…3 miles southeast of Pinecliffe; 12 inches…5 miles west-southwest of Conifer; 10 inches at Evergreen and 5 miles west of Littleton. Along the Palmer Divide…south and southeast of Denver… The combination of gusty northerly winds and snow caused localized blizzards. Storm totals included: 7 inches… 2 miles east of Castle Rock; 6 inches…4 miles east of Parker and 2 miles northwest of Elizabeth; and 5 inches near Castle Pines. The wind…gusting to 35 mph…stirred up snow drifts from 1 to 3 feet in depth. Northeast winds gusted up to 49 mph at Denver International Airport; and 2.0 inches of snow was observed at the former Stapleton International Airport. In 1901…strong northwest winds raked the city for 2 days. On the 2nd…winds were sustained to 55 mph with gusts to 62 mph. The Chinook winds warmed the temperature to a high of 72 degrees…a record maximum for the date. On the 3rd…winds were sustained to 61 mph with gusts as high as 65 mph. The high temperature was 59 degrees. In 1964…heavy snowfall of 6.3 inches was measured at Stapleton International Airport. East winds gusted to only 20 mph behind a cold front. In 1978…5.0 inches of snowfall were measured at Stapleton International Airport where northeast winds gusted to 24 mph on the 2nd. The passage of a cold Canadian front kept temperatures only in the teens and 20’s on the 2nd after a high temperature of 33 degrees shortly after midnight. The temperature…after a morning low of 3 degrees below zero…climbed to only 14 degrees on the 3rd…setting a record low maximum for the date. In 1963…heavy wet snow was accompanied by strong gusty winds across metro Denver. Snowfall totaled 11.6 inches at Stapleton Airport where north winds gusting to 44 mph caused much blowing and drifting snow. Hazardous driving conditions resulted in many traffic accidents. In 1976…snowfall totaled 8.0 inches at Stapleton International Airport where…on the 4th…northeast winds gusted to 31 mph reducing the visibility to as low as 1/4 mile. Maximum snow depth on the ground was 7 inches. Nine inches of snow were measured in Boulder. This entry was posted on Sunday, February 24th, 2019 at 4:38pm MDT and is filed under Weather History. You can follow any responses to this entry through the RSS 2.0 feed. You can skip to the end and leave a response. Pinging is currently not allowed.